This good looking bird found me in Capital Reef National Park, Utah. Our paths crossed in a very remote part of the country, at the end of a gravel road in one of our countries more scenic National Parks (if you ever get the chance, go to Capital Reef). Any-hoo, this little fellow certainly wasn't shy. He posed and preened on his (or her) rock for a good five minutes. As you can see, he certainly knew how to speak to the camera. However, despite my fondness for this bird, I really knew so little about him. Here's what I could discern at the time: This bird looked a bit fat; this bird had red legs, this bird had striking markings along his sides and face; this bird lived in a dry climate; this bird didn't seem to be eager to fly; this bird looked for food on the ground around bushes; this bird had a few of his friends around. This bird is the Kurdish national bird, of all things. This bird originated in eastern Europe but is now found in quite a few places in the world, including parts of the western US (like...Utah). This bird is considered to be a "Eurasion upland game bird." The Chukar is classified as a partridge (I always wondered who it was in that pear tree.) The Chukar typically eats seeds, grass and, occasionally, insects. What I call "striped sides" are actually referred to as "rufous-streaked flanks." The Chukar prefers to run, not fly, when in danger. The Chukar's main habitat range is in Pakistan and Afghanistan. 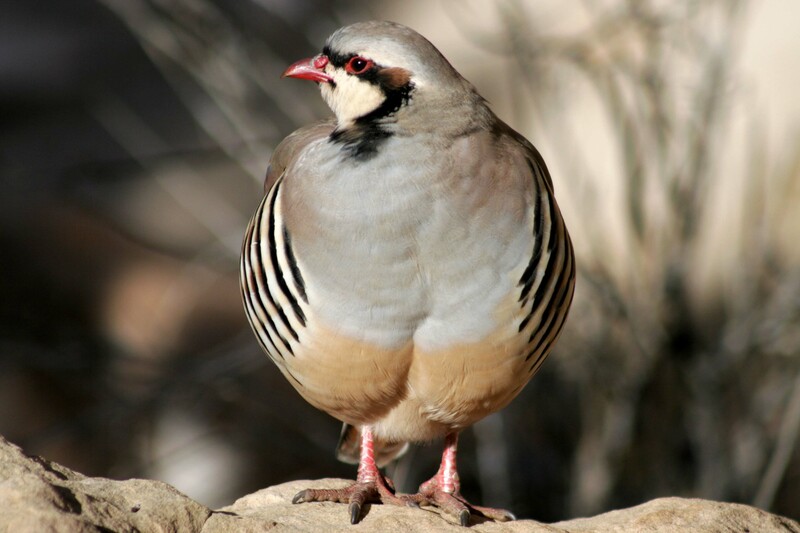 Chukars are very adept at finding water in arid climates, and does not migrate from it's arid habitat. A Chukar usually produces a clutch of 10-21 eggs. So, once I became armed with the name of the bird, I had (in a sense) some power over the bird. It is pretty common thinking to understand the there is power in naming; knowing or using the name of something gives a sort of power to the namer. For some time I have been intrigued by this idea, partly because I "intuit" it to be true, although I'm not always sure how it works. One example I often seem to think of is medicine. If a doctor is presented a patient who complains of severe side pains, abdominal tenderness, fever, nausea and vomiting, but is not able to put a name with the symptoms, the doctor is more or less helpless. However, if the doctor is able to evaluate the symptoms and conclude, "Aha! Appendicitis. ", then the doctor has "power" over the affliction. The doctor now knows the path of treatment, expected outcomes, possible complications, and all sorts of other things. To name something is indeed to gain a sort of power. I don't want to sound too extreme in my stance that naming something gives power. Even though I now know the name of Chukar, he (or she) is doing exactly what Chukars do. My possession of his name really doesn't affect him. But from my perspective, knowing that this bird was a "Chukar" certainly opens up a much larger world of knowledge than does "that kind of fat, striped bird in Utah." Regardless, I'm glad Chukar and I met, and I hope he's having a good day. I like the picture of the bird - though I'm still waiting on this week's pic-of-the-week - but I have to say that the Waterfront at night picture and commentary is a treasure chest of information that perks the interest and riles the curiousity. Hats off to thedaver.net. I'm just discovering the comments option.